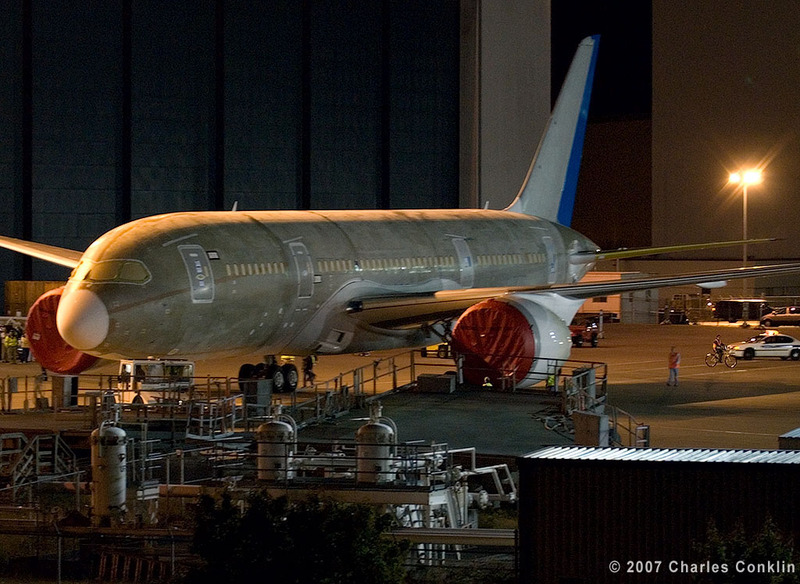 Charles Conklin, aka Flightblogger, scored a major coup: exclusive first photos of the new Boeing 787 Dreamliner rolling out of manufacturing at the Everett, WA plant. The Dreamliner represents the antithesis of Airbus’ giant new A380 – a smaller, light, fuel-efficient plane that emphasizes passenger comfort over a vast behemoth that packs them in like sardines and requires airports to pay for expensive new gate upgrades just to host. Boeing is in many ways the antithesis of Airbus, too – though the argument that Boeing’s supposed civilian market prowess is partially subsidized by its vastly more lucrative defense contracts has some merit. Still. Look at that baby and tell me you wouldn’t love to fly aboard. I’ve flown aboard a few 777’s and the Dreamliner promises to be even more of a sublime travel experience.